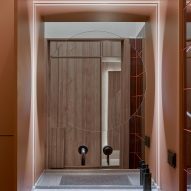 Kiev-based interior designer Lera Brumina has used contrasting textures and colours to unite the light and dark rooms of this 99-square-metre apartment in Minsk, Belarus. The apartment on the fifth floor of a contemporary building in a quiet green district features high ceilings and tall windows along one side. The one-sided distribution of windows means that one half of the apartment is extremely bright while the rear half is a lot darker. The lighter half of the apartment houses a child's bedroom and the open-plan living room and kitchen. 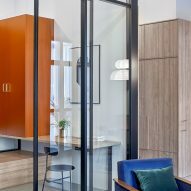 A master bedroom and a home office are separated from the living room by a sliding glass door, which allows light to filter through into the rooms when the door is closed. When the door is open the home office and living room to be used as one space. 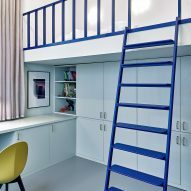 This space can also function as a spare room. 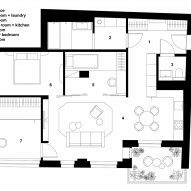 The bathroom, a second toilet, a hall with built-in storage and a utility room are all located in the darker part of the apartment. 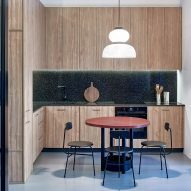 Brumina used a palette of contrasting colours and textures to finish the apartment, such as warm wood, deep purple textile and grey-green resin flooring. 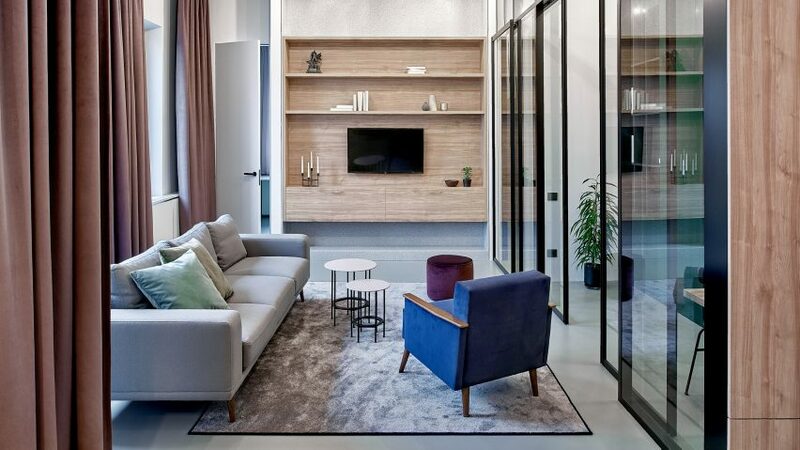 The consistent colour palette and materials were used to create a cohesive look throughout the apartment, while all the furniture was custom made as were a series of unique prints. 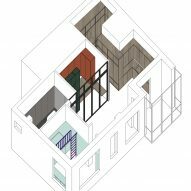 "My customers are young active people who formulated their wishes for colour contrasting housing from the beginning of the project," Brumina told Dezeen. "Each room is dominated by a certain colour or combination, but it is also found in accents in other rooms," she said. 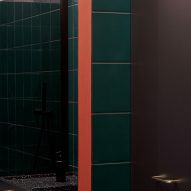 "For example, the main purple color of Ceramica Bardelli tiles in the bathroom appears again in the living room in the form of curtains, as well as in the bedroom in the form of a pouf." 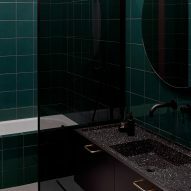 "The second bathroom features dark emerald green tiles made by the same manufacturer, which are repeated in a cabinet," she continued. 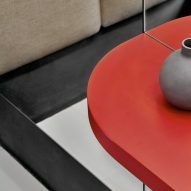 "Red is used on the dining table, the console in the bedroom and in the bathroom. 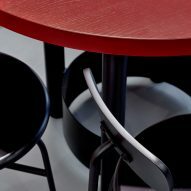 But all this colour cacophony is counterbalanced by the calm texture of the wood and the single neutral shade of grey on the floor." 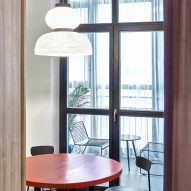 In 2016 Spanish designer Patricia Urquiola filled Milan hotel Room Mate Giulia with a colour clash of custom furniture, while creative consultancy Masquespacio used clashing colours and sharp angles for the interior of this smartphone repair shop in Valencia.